Aside from SH shirts, we've also made some SH items recently, I've decided to make a thread for it since it's for the use of the whole forum. 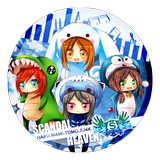 Credits to enjelia of Deviant Art for the SCANDAL Chibis. Feel free to grab these designs if you know a place in your location that creates them.